In May this year, Samsung paid a record fine to Apple, having been accused of copying iPhone’s patents. In April, Apple had also been charged with a million-dollar fine to compensate for the plagiarism of VisnetX’s iMessage. Plagiarism is haunting the tech world, and as such, it is paramount for companies to register their ideas. The number of submissions for trademark requests is growing exponentially, following up on the trend of rising entrepreneurial spirit in the country. In 2017 there were 711 nationwide submissions for trademark requests, according to Pordata. This value decreased gently after a considerable peak in 2015, a year that witnessed a record number of 1.055 submissions. 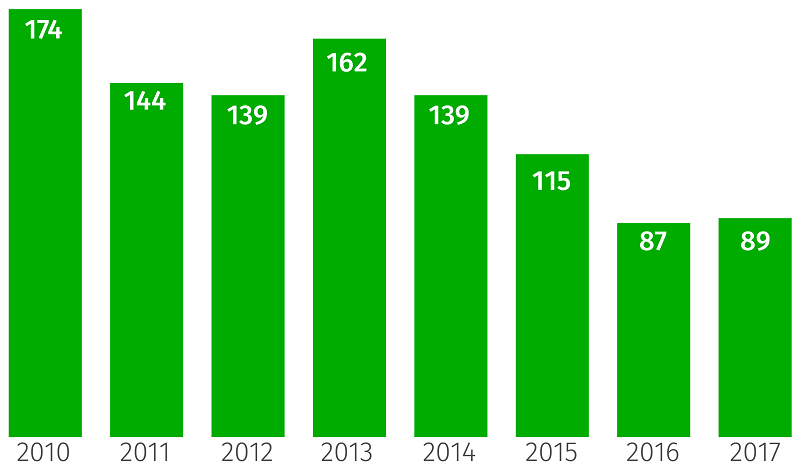 89 patents were successfully granted in 2017, representing an acceptance rate of 12,5%, which in comparison to 2016 represented an increase in the acceptance rate, as that year from the 812 requests, only 87 were granted a patent (10,7% acceptance rate). In 2015, the rate of acceptance was equally lower, as 10,9% of the 1.055 submissions were granted a patent. Nevertheless, granting a patent is a lengthy process — one that in general takes years to be finalized — which means that those accounting as granted patents each year are the result of accumulated submissions from previous years. According to data recorded since 1990, 114 patents are registered per year in the country. In regards to community (EU) registered patents, the number of patents granted to Portugal by the European Patent Organisation reached its 10-year record: in 2017, 68 patents were granted to Portugal via the EPO, representing a 15,3% growth in comparison to 2016. The submissions, however, were fewer: 149 requests for patents were sent from Portuguese companies to the EPO in 2017, in comparison to 158 in 2016. The International Iberian Nanotechnology Laboratory in Braga (INL) was the top submitter of requests for patents from Portugal to the EPO. In 2017, it was the highest Portuguese bidder for patents, summing up a total of eight requests delivered to the European organization. INL has many interesting projects in their hands at the moment, and they are now investing their time in a special exhibition at Francisco Sá Carneiro airport in Porto that aims to show passengers how nanotechnology has the potential to transform flights in “safer, more comfortable and far more convenient” trips. It is an interactive exhibition that reproduces an airplane’s interface incorporating a vast list of INL’s nano-technological innovations. The goal of their initiative is to show nanotechnology’s evolutionary applications in the field of commercial aircraft, and how these changes will affect the overall flight experience. 3D food printing, flexible solar panels, MEMS human motion sensing technologies, cabin light infrared micro-sensors, wireless device chargers, antibacterial products, and even sustainable and eatable packages aiming to reduce waste and reinforce food safety.